of two of my pieces of jewelry on Etsy lately. This is an original fused glass cab with floating dichroic sparkles. I melt the cut layers of glass in my kiln a 1450 degrees. 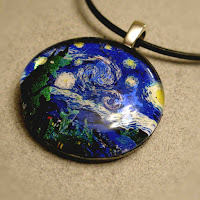 Then I edit and print the Starry Night picture. The photo is placed behind the fused glass and attached with a very strong and waterproof adhesive. A waterproof backing is attached and then a silver plated bail is attached. Finally, the entire pendant is strung on a 3mm black leather adjustable pendant cord. This cord adjusts from 17-3/4" to 19-1/2". The cord can be shortened by placing a knot in the leather cord near the clasp. 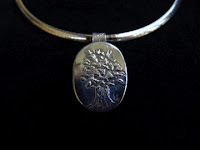 This is a beautiful "Tree of Life" pendant made of fine silver. The process begins with Precious Metal Clay (Powdered silver in clay form). The clay is rolled out. I press a stamp into the clay, which I made by carving in Sculpey Clay. Then the oval shape is cut and the bail is attached. The pendant is fired at 1450 degrees and then polished to a beautiful shine. This pendant measures 1 inch by 1.5 inches. This pendant is also strung on a 3mm black leather adjustable pendant cord. But it looks beautiful when worn with an Omega Chain as shown in the picture.